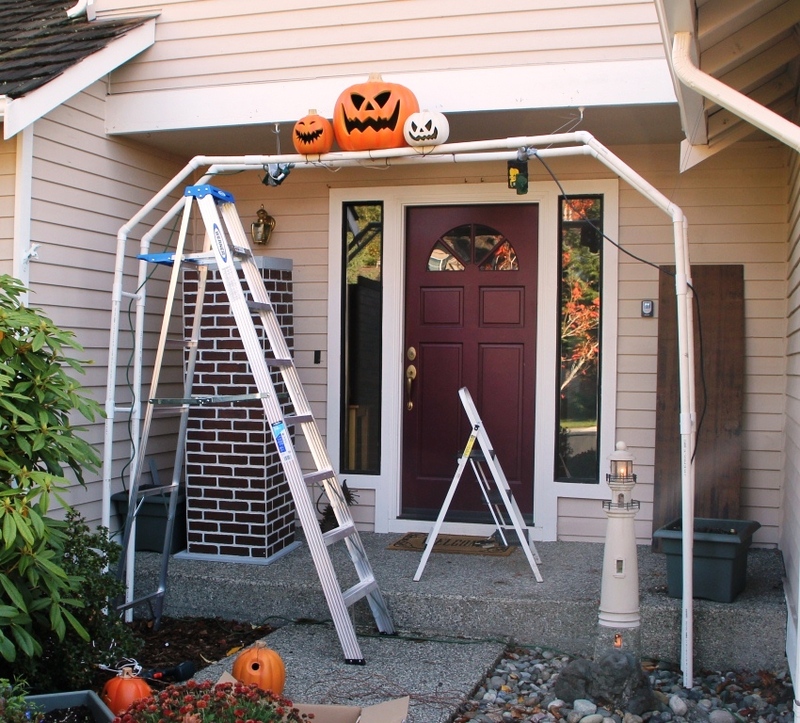 We decided to change up our annual Halloween Display this year including adding this Jack O Lantern Arch at the entrance to our doorway. We got some ideas from photos we had viewed online however the final result was achieved via some trial, error and on the go fixes including the use of Duct Tape. First we purchased 30 pumpkins. We found these at Michaels, Joanne's and Target. They are a foam type, hollow and can be carved. Then we needed something to put them on. this arch measure 8 feet tall, 10 feet wide and includes a 45 degee angle portion on each side to compliment the arch style. We first pounded in 4 rebar's into the ground and placed the PVC pipe over them to create stability. This has worked very well so far. 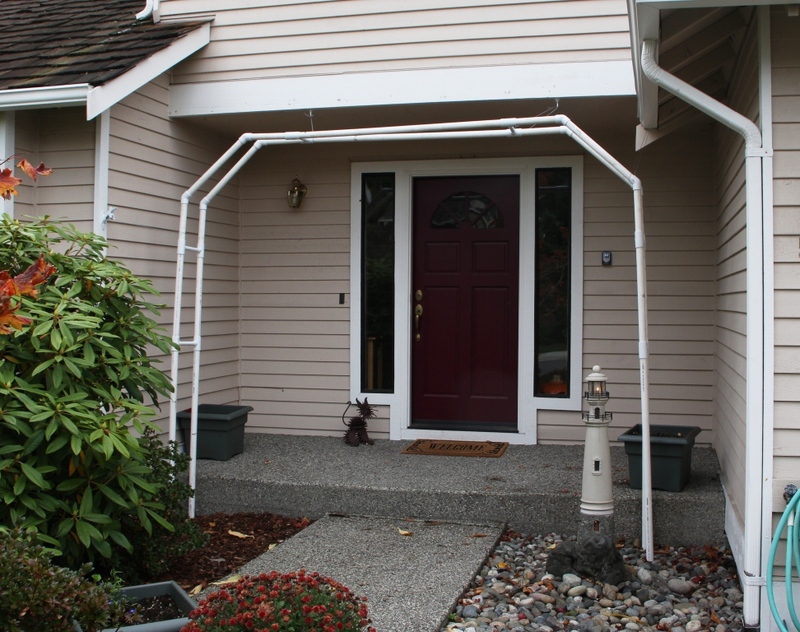 We also included 6 cross bars fairly equally distributed around the arch to create stability and a uniform distance between the two main PVC pipes. Then... we got started placing pumpkins with the biggest one on the top right in the middle. We also chose to place the smaller sizes right next to the big guy to emphasize his stature. 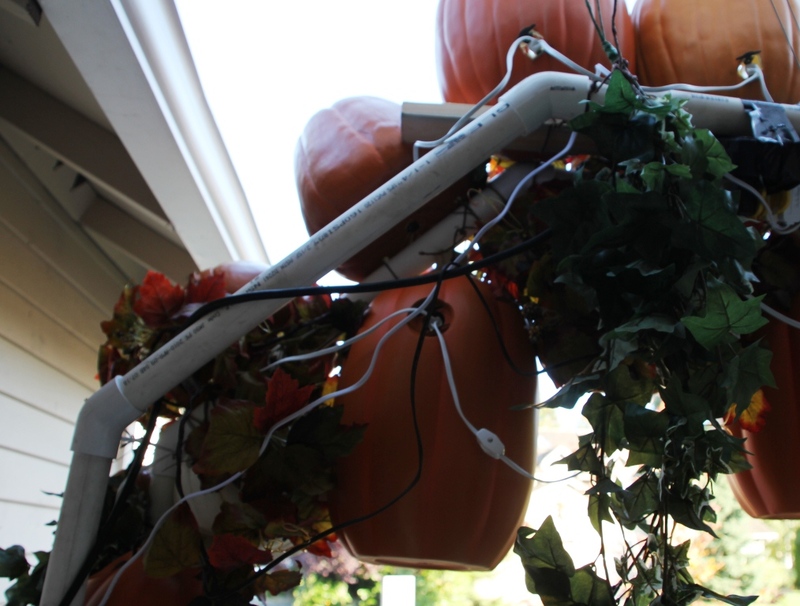 We secured the pumpkins to the PVC pipe with a craft wire we found at Michael's. The wire is wrapped with a brown paper material so blended in well. This is when we decided that the arch needed a little more securing. The weight wasn't getting too bad yet however, it does get windy in the PNW and that could cause a problem. Se we purchased some small gauge wire and screw in hooks and tied the wire around various key points on the arch and five main support locations on the house, front, back and sides of the arch. 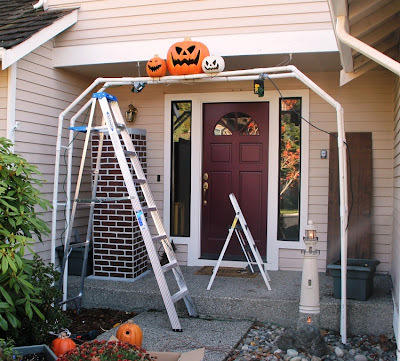 We were having some issues with getting the pumpkins to sit just right on the arch so I added this 2 inch x 1/2 inch x 8 foot board on the top to help support the pumpkins. Once the arch was full of pumpkins, two rows and two wide. 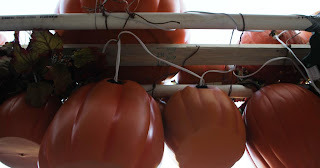 70 pumpkins in all... we then moved on to stringing and placing the lights in the jack o lanterns. Be sure to use lights that are for outdoor use. Then we needed to hide the PVC pipe... We painted some of it black and in retrospect, I recommend painting it all brown or black before you set it up. We then found fall leafy vines at Michael's and Joanne's for 60% and 80% off and filled in the gaps!! oh my i must make one of my own!! i have a question tho! what type of light strands did you use for this? they must be at least C-9's? and they seem widely spaced as compared to a regular light strand? did you uses several strands for each pumpkin or wire these specially? any instructions on the wiring and lighting would be great thanks! Yes. C-9 Bulbs. I used shorter length strings of 6 to 8 bulbs each. Light strings are similar to ones used for Department 56 displays. I placed several outlet strips along the arch. If there were bulbs inbetween pumpkins I was not able to use I removed or blacked out. Will be making again this year and plussing it up for even more! 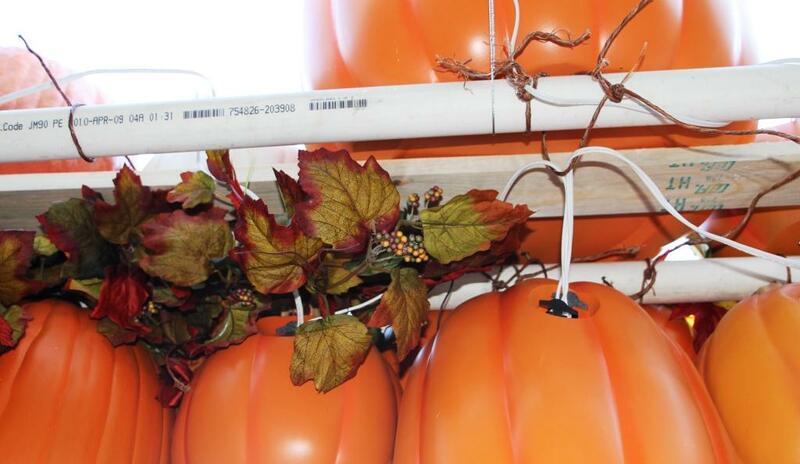 Where can you find these pumpkins in bulk? Where did you get yours? This is beautiful! I found it via Pinterest. 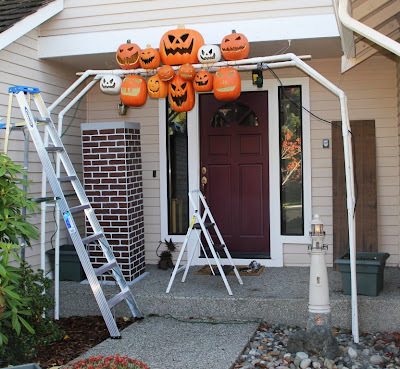 I was wondering if you use have to pierce the pumpkins in order to hang them with that little brown-wrapped wire, or do you just use it to secure the light cords to the PVC pipe? Forgot to hit the button that notifies me of follow-up comments, so I'll ask another: how are you storing 70 pumpkins? That's just awesome. I need that! We are hosting our first Halloween Party. I want it to be scary and grand, just like our costumes will be. We have to use your idea. Thank you! I will post photos. This is sooooo awesome! Forgive me for asking but how much did this project cost? Thanks Tera. It has been built up over a few years... We now have over 150 Jack O Lanterns on this project. I wanted to ask you if you've dealt with rain yet and if the pumpkins filled with water or not. Also did you put a film over the openings in order to diffuse the light or can you see the bulbs through the openings. I've had several friends tell me I should make this but our archway is twice as big and honestly I don't think I have the energy! :) Oh and yes I to have a holiday storage unit! Kie, it rains alot here near Seattle during October. They used to fill with water a bit however I now have holes drilled in the bottom of each to allow for drainage. 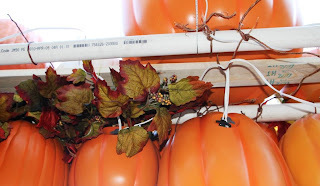 I place the bulbs in a manner that is low or high inside the pumpkin so you usually cannot see the light... I also use Orange lights and some that flicker... It is alot of work but it is so worth it! I use regular Christmas light strings with C7 bulbs.., all orange. WOW...you guys don't mess about...excellent! We'd like to share this over at ours and I'll get the link to you when its live. Thanks Patti! Wait until you see this year's!! Have you posted this year's yet?? So awesome!!! Great job!!!!! This is fabulous! I'm attempting this next year- just got a boatload of pumpkins in a discount grab bag at Michael's. So now I get to think about it all winter!! 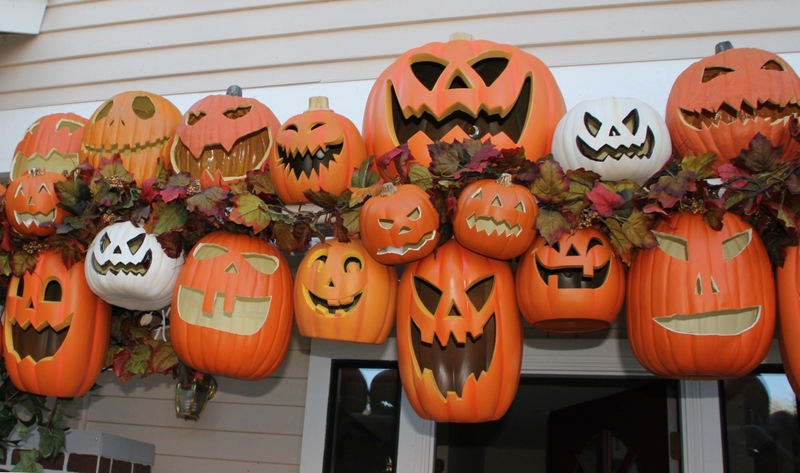 I would love to see this year's pumpkins!! Man, this is amazing. 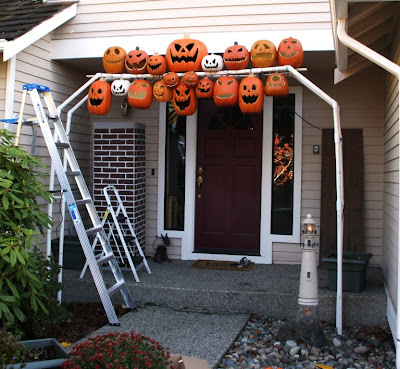 It's usually my husband who goes crazy for Halloween decorating, and we won't have enough time to do it this year, but I don't think I'll have a problem convincing him for next year! Fantastic idea, and thank you so much for sharing!! Michaels and/or JoAnns should be paying you! They will make a killing in pumpkin sales after people see this! We got them at Michaels stores and carved them ourselves. 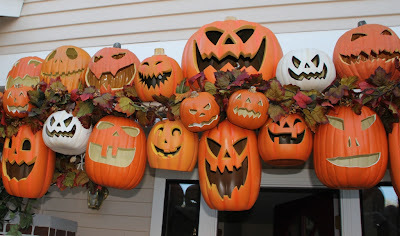 I'm in the process of building now I bought my first wave of 20 pumpkins from Michaels and Joann Fabric. Even on sale Id say I've spent 150 with 50 more to buy ! But it will be worth it! 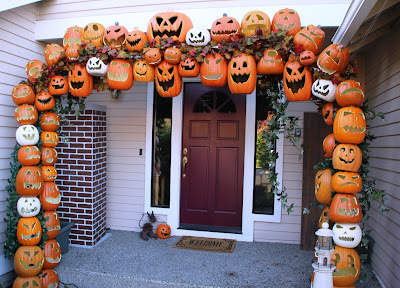 Hi there, I am also in the process of making this arch, but I have a question about the pumpkins on the sides. How do you attach them to keep them from sliding down the pipe, or are they sitting/resting on the ones right below them? Ok thank you very much! I love your archway, mine will only be about half that size because I have a narrower entry way, but I'm very excited as I see it start to take shape. Thanks so much for your ingenuity!! Maybe 1/2 way done my arch. Thanks for the inspiration. Will update when I'm done. It does take a lot longer than I imagined. Fantastic! Looking forward to the photos! So in all , how much did u spend for this project and is it easy to take down ? Likely in the hundreds of dollars. $10 to $20 per pumpkin, 125 total. $100 in vines. $50 in pvc pipe and connectors. Expanded the number of pumpkins over several years. Came across this on pinterest. This is AMAZING!! I might have to take a trip to the craft store and hardware store this weekend. I have a Halloween party every year, people usually come in through the back yard so I thought about putting the archway across the drive way. Do you think it would be too unstable without a porch or house to support it? Also what time of year did you find the pumpkins on discount? I wanna make sure I hit the sales! Thank you! Making across the driveway is a long ways. The pvc pipes will sag with weight. I would suggest moving to a wood frame that will be strong enough to hold up. Also, the porch and house do not support the display at all. It is free standing except for a couple of wires for stability in PNW winds. What size pvc did you use? 1 Inch. Depends on how big you choose to make the entire arch. go to home depot and feel how stiff or flexible each size is to get an idea of what you are working with. All done! Finally. How do I post photos? 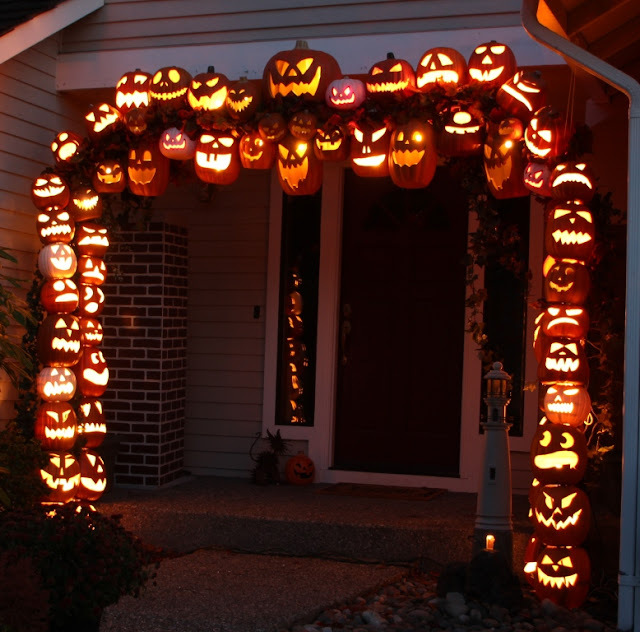 Don - Thanks for being the inspiration for our own pumpkin arch - one question for you. 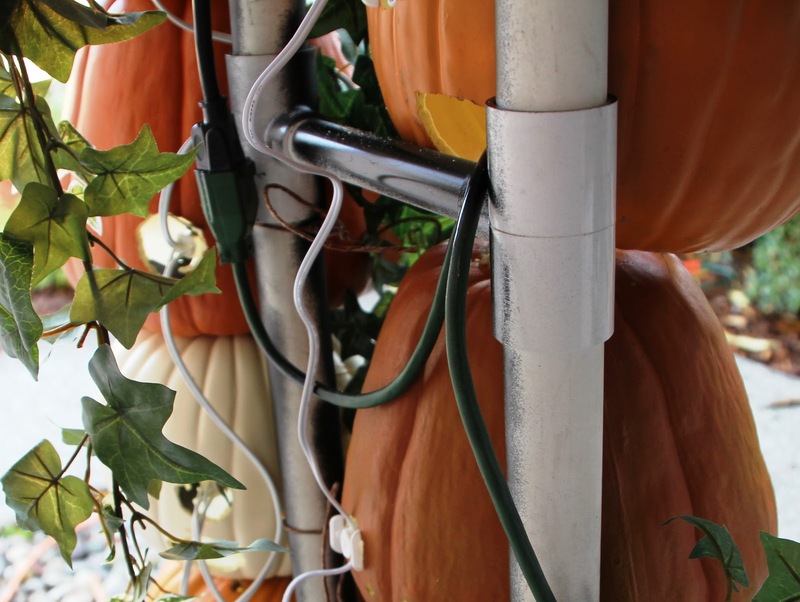 Your photos show a C7 light strand, but I noticed most of your pumpkins have the "clamps" to mount the bulb in place in the hole - did you purchase these separately or buy a C7 strand with the clamps in place? My existing pumpkins don't have clamps that can be removed. The clamps were on the light string. there were none on the pumpkins. After I put the light inside the back of the pumpkin I also covered it with a piece of duct tape just to be sure it didn't pop out. Being in the Pacific Northwest I had to take extra measure against rain and wind. Did you use a dremel to make quick work of carving? I used plain old sharp cutting knives on the foam pumpkins. Good idea! Although, I will not be able to celebrate at home this year as my house is under renovation. I am planning to book one of the outdoor NYC venues and will use this idea there. It has to be a good party and I am working very hard for it.